MCC vs. Jamaica. Wright drives a Robin Hobbs delivery, January 1968. 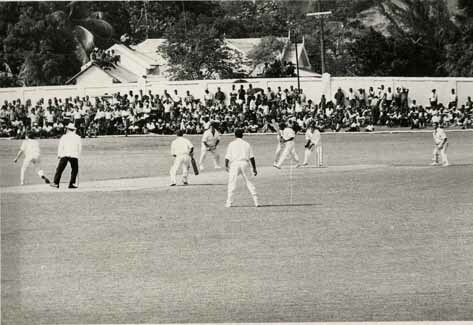 This photograph shows a match between Marylebone Cricket Club (MCC) and Jamaica cricket team in January 1968. It shows a ball been bat and players and an umpire in action. Spectators can be seen at the back of the image. This picture was taken in January 1968. “MCC vs. Jamaica. Wright drives a Robin Hobbs delivery, January 1968.,” National Library of Jamaica Digital Collection , accessed April 20, 2019, https://nljdigital.nlj.gov.jm/items/show/310.